Ever since the Presidential Dollars have come out, many people seem to have a hard time distinguishing between the rim of the coin, and the edge. These terms have very specific meanings; make sure that you are using them correctly. The edge of a coin is sometimes called the "third side." Numismatists call the heads side the obverse, and the tails side the reverse, reserving the term edge for the third side, or the side that you see if you look at the coin in the space between the obverse and reverse. The edge runs around the entire circumference of the coin. The minting process may also impart a design on the edge of the coin, or it may be left plain. For example, the portion of United States dime or quarter that has the reeding on it is the edge. The edge is plain on pennies and nickels. Coin designers implemented different devices on the edge of the coins to prevent clipping. Clipping is the practice of shaving off a little bit of a precious metal coin, such as gold or silver, from the edge of the coin to gather up a significant amount of shavings for its bullion value. Additionally, these edge devices help protect the coin from counterfeiting. A coin with the plain edge has no devices or lettering on it. I may be uneven if a collar is not used to hold the planchet in the coining press. If the coining process employs a collar during the striking process, the edge will be smooth and even around the entire circumference of the coin. A coin with a reeded edge has a series of evenly placed vertical grooves around the entire circumference of the coin. The collar has these grooves milled into it, and are imparted onto the edge of the coin during the striking process. Coin collectors in the United States also refer to reeded edge coins as "ridged" or "grooved," while people in the United Kingdom refer to them as "milled." Lettered edge coins have words or symbols incuse into the edge of the coin. These inscriptions may include the date, mint mark, denomination, motto, etc. Coins with a decorated edge may have different designs impressed into the edge of the coin. Flowers, vines, bars, and swirls have all been used to decorate the edges of coins around the world. Coin designs can include a rim on a coin on both the obverse and the reverse. In fact, a coin can be said to have two rims, one on the obverse and one on the reverse. The rim is the up-raised flat part of the coin that completely encircles the perimeter on the front and/or back. 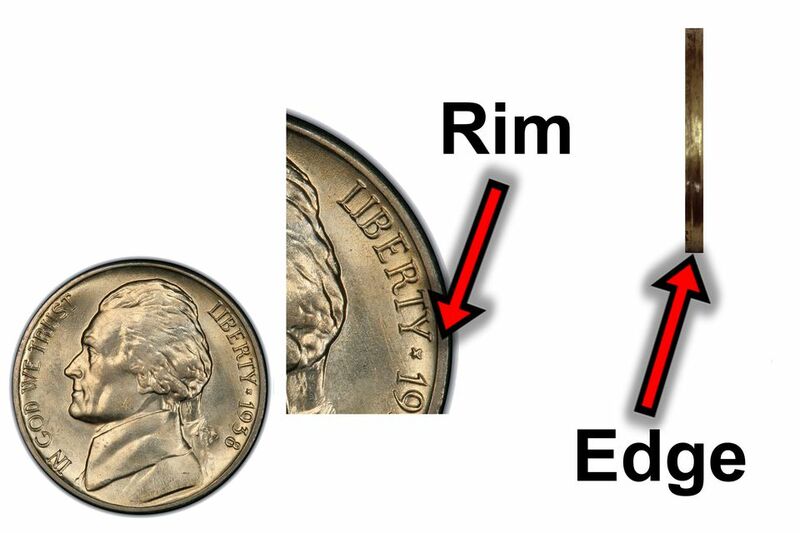 On U.S. coins, the rim is usually very thin, but on Presidential Dollars it is much wider, the purpose being to allow blind people to tell the dollar apart from the quarter dollar coin by touch alone. This standard was created back when the Susan B. Anthony dollar also had the reeded edge, so the lack of reeding wasn't enough for the blind to make the distinction. Originally the rim of the coin was solely imparted during the striking process. When mint workers produced a coin die, a recessed flat area that encircled the design elements on the die was imparted at the very end of the die production process. When the die was used to strike a coin, it left a raised flat rim around the circumference of the coin. As coin minting processes evolved, the addition of a collar inside the coining press allowed the planchet to be held squarely between the dies during the striking process. Before mint workers send the blanks to the coining press, they put them through an "upsetting mill." The upsetting mill contains a rotating wheel within a channel that slightly get smaller to squeeze the coin slightly. This process imparts a small raised rim on each side of the coin. Additionally, this results in a uniform diameter on every coin that goes through the upsetting mill. When the coin is ready to be struck it falls into the collar that holds the planchet between the two dies for striking. Additionally, this raised rim imparted by the upsetting mill helps the metal flow consistently into the recesses of the coining die to aid in the striking process.